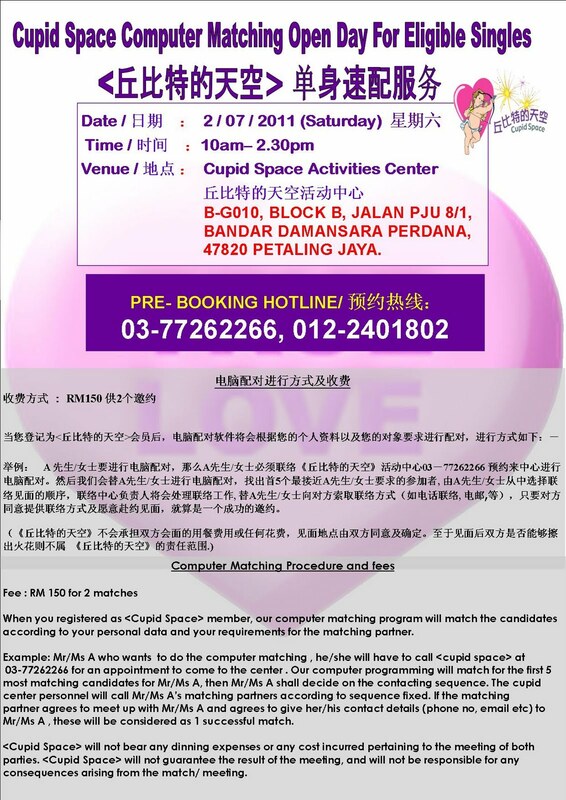 Cupid Space Activities Center is opening on 04/01/2014 （Saturday) form 10.30am -2.30pm at Damansara Perdana venue for cupid member to do the computer matching service， those members whom are interested to do the computer matching, pls call 03-77262266/012-2401802 for appointment. 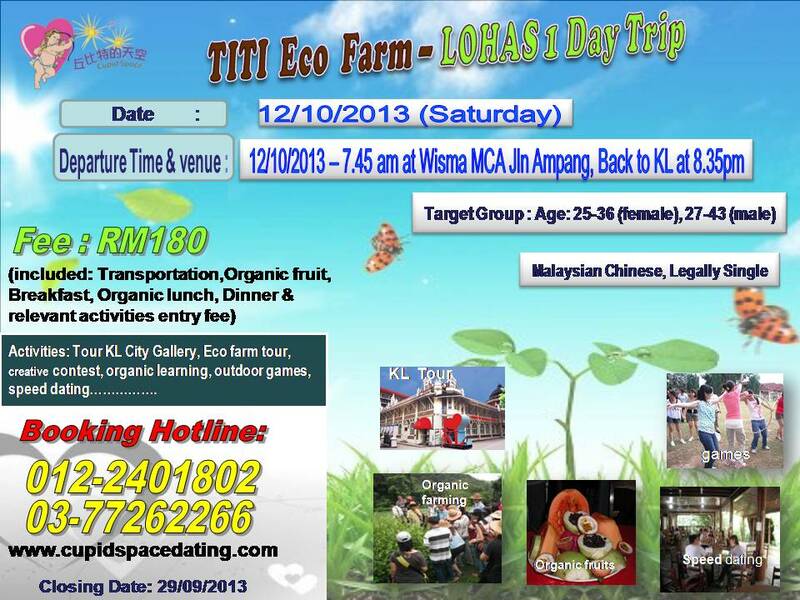 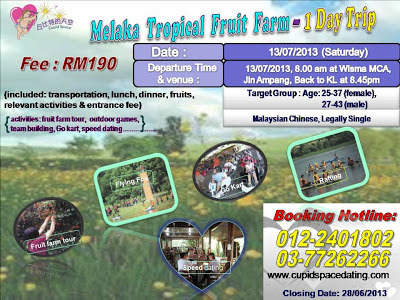 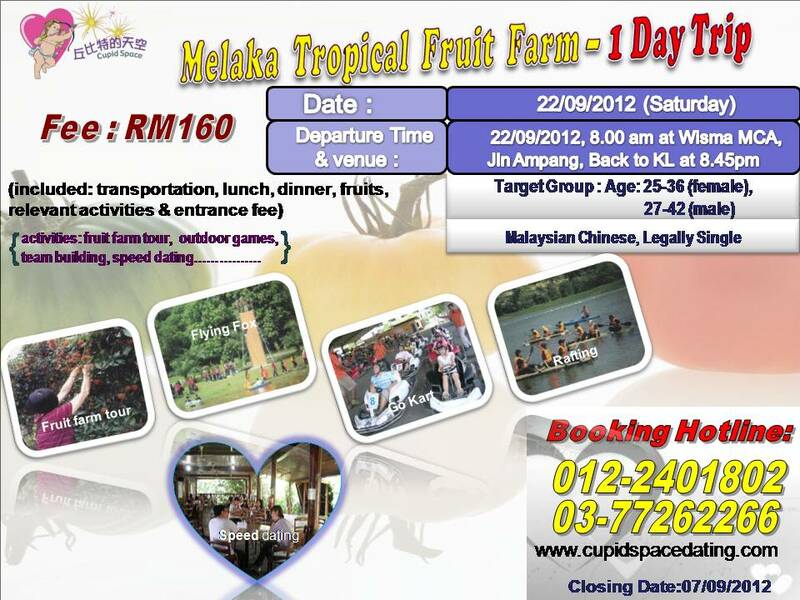 Last Call, Only limited seats left, Call 012-2401802 to book before 8/12/2013 !! 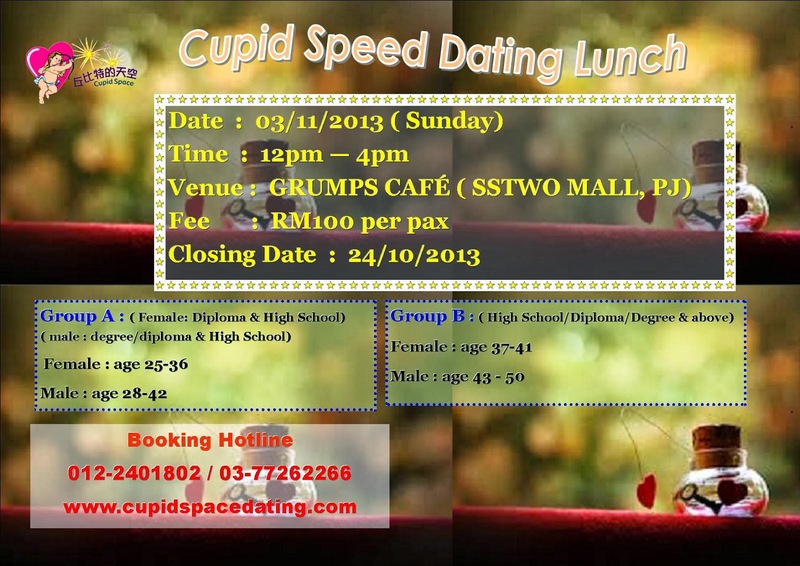 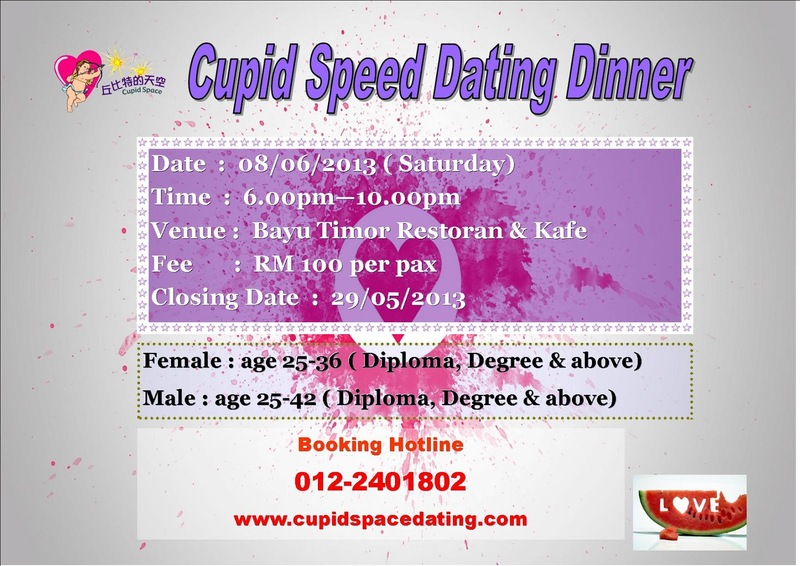 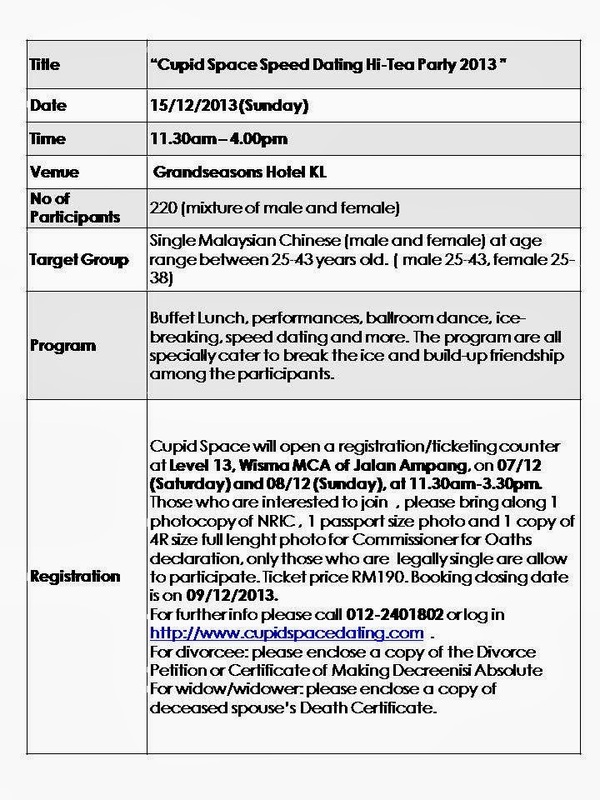 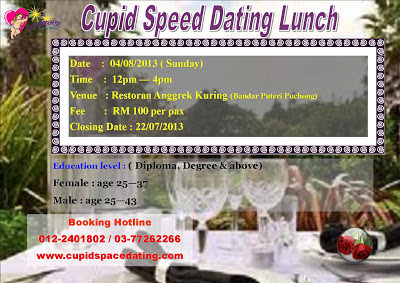 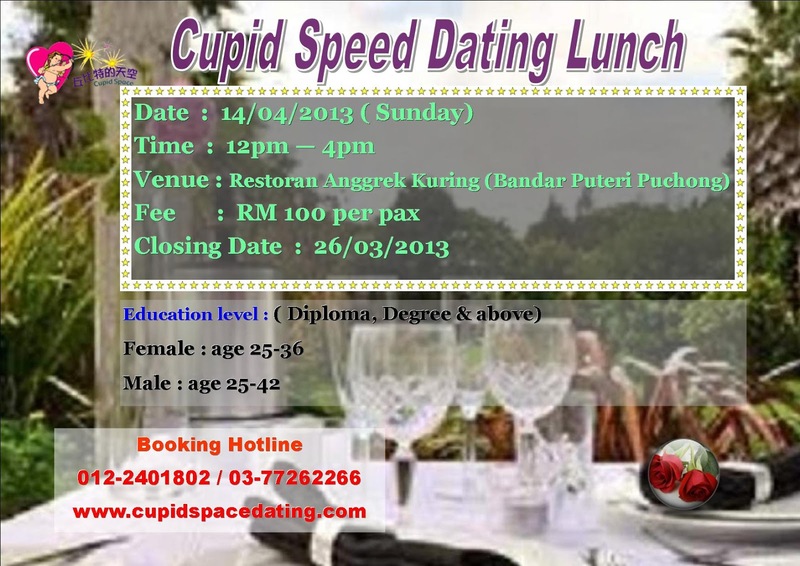 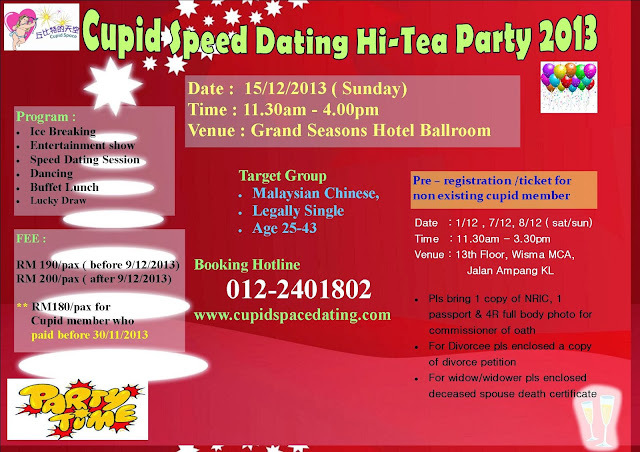 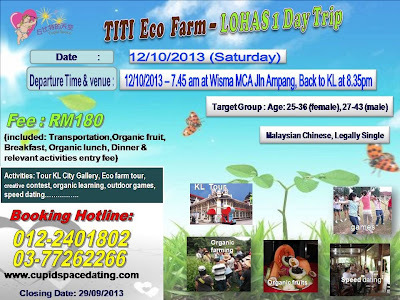 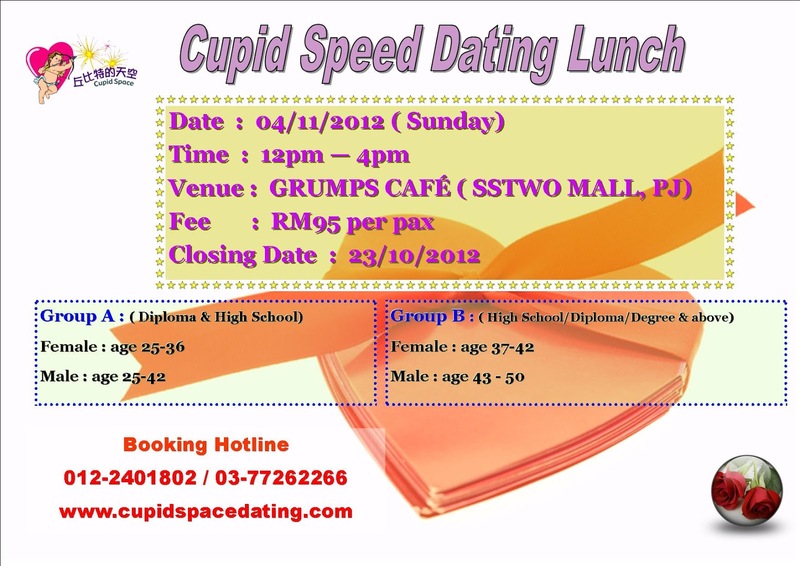 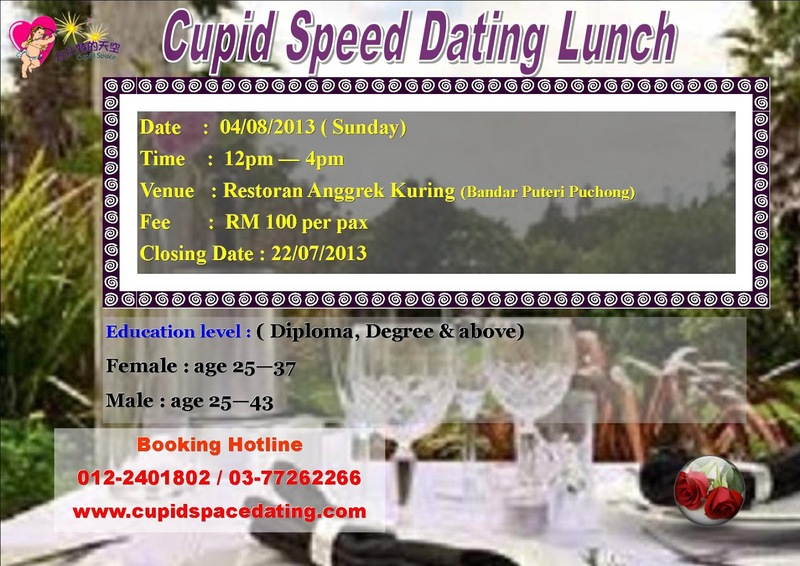 Cupid Speed Dating Hi-Tea Party 2013 (sunday) - a Hi-Tea Party event for Malaysian Chinese who are legally single （ age 25-42) to gather and meeting for friendship, you will have opportunities to mingle with 200- 250 singles during the party event.
" 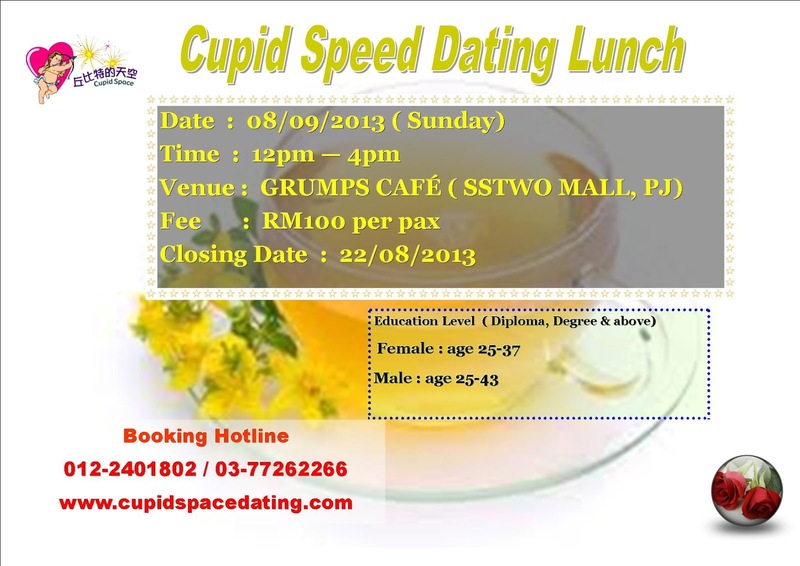 Cupid Speed Dating Hi-Tea Party 2013"
Cupid Space Activities Center is opening on 09/11/2013 （Saturday) form 10.30am -2.30pm at Damansara Perdana venue for cupid member to do the computer matching service， those members whom are interested to do the computer matching, pls call 03-77262266/012-2401802 for appointment. Cupid Space Activities Center is opening on 05/10/2013 （Saturday) form 10.30am -2.30pm at Damansara Perdana venue for cupid member to do the computer matching service， those members whom are interested to do the computer matching, pls call 03-77262266/012-2401802 for appointment. 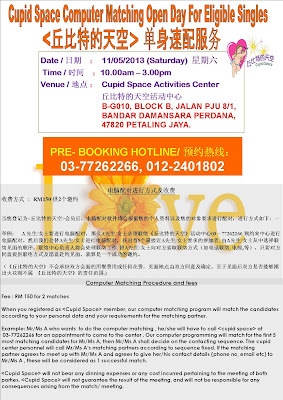 Cupid Space Activities Center is opening on 07/09/2013 （Saturday) form 10.30am -2.30pm at Damansara Perdana venue for cupid member to do the computer matching service， those members whom are interested to do the computer matching, pls call 03-77262266/012-2401802 for appointment. 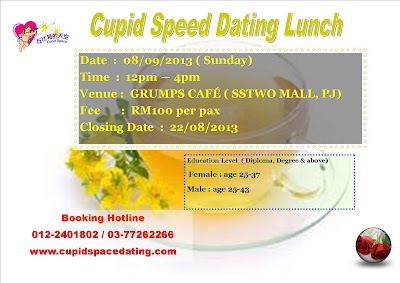 Cupid Space Activities Center is opening on 3/8/2013 （Saturday) form 10.00am -2.30pm at Damansara Perdana venue for cupid member to do the computer matching service， those members whom are interested to do the computer matching, pls call 03-77262266/012-2401802 for appointment. 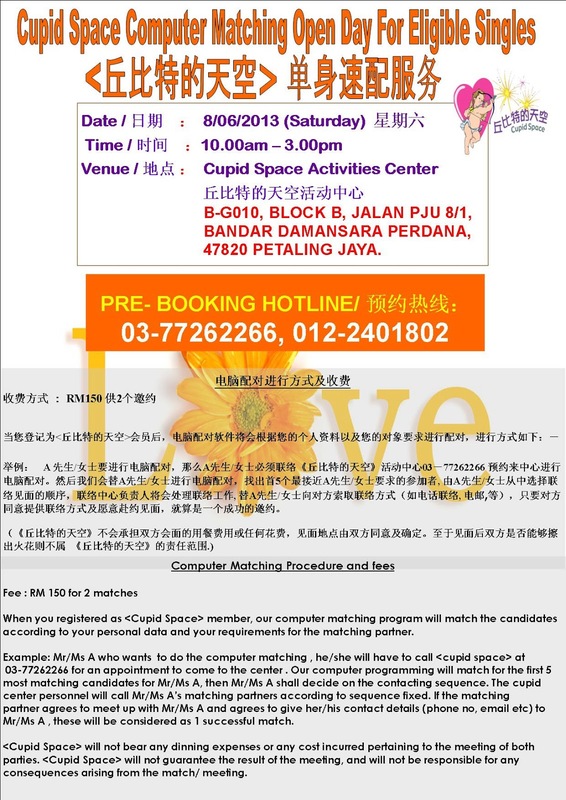 Cupid Space Activities Center is opening on 06/07/2013（Saturday) form 10.00am -3.00pm at Damansara Perdana venue for cupid member to do the computer matching service， those members whom are interested to do the computer matching, pls call 03-77262266/012-2401802 for appointment. Cupid Space Activities Center is opening on 08/06/2013（Saturday) form 10.00am -3.00pm at Damansara Perdana venue for cupid member to do the computer matching service， those members whom are interested to do the computer matching, pls call 03-77262266/012-2401802 for appointment. 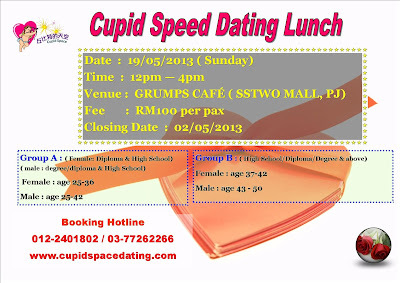 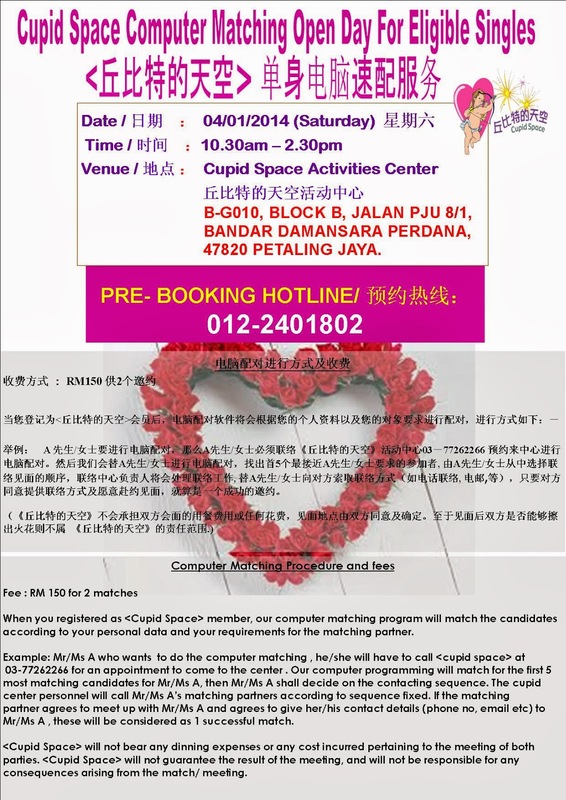 Cupid Space Activities Center is opening on 11/05/2013（Saturday) form 10.00am -3.00pm at Damansara Perdana venue for cupid member to do the computer matching service， those members whom are interested to do the computer matching, pls call 03-77262266/012-2401802 for appointment.